Definition at line 54 of file llfloaterworldmap.h. Definition at line 171 of file llfloaterworldmap.cpp. References LLUICtrlFactory::buildFloater(), createWorldMapView(), gUICtrlFactory, and NULL. Definition at line 281 of file llfloaterworldmap.cpp. References mFriendObserver, mInventory, mInventoryObserver, mTabs, and NULL. Definition at line 1001 of file llfloaterworldmap.cpp. References LLPanel::childSetMinValue(), f, LLTabContainerCommon::getCurrentPanel(), LLRectBase< Type >::getHeight(), LLView::getRect(), LLRectBase< Type >::getWidth(), LLWorldMap::getWorldHeight(), LLWorldMap::getWorldWidth(), gWorldMap, llclamp(), llfloor(), llmin(), mTabs, REGION_WIDTH_UNITS, S32, and ZOOM_MAX. Referenced by LLWorldMap::processMapBlockReply(), LLWorldMap::processMapLayerReply(), LLMapLayerResponder::result(), and show(). Definition at line 849 of file llfloaterworldmap.cpp. References ADD_BOTTOM, LLAvatarTracker::applyFunctor(), LLPanel::childGetListInterface(), end, LLAvatarTracker::instance(), list, LLCollectMappableBuddies::mMappable, LLCtrlSelectionInterface::OP_DELETE, and S32. Referenced by friendsChanged(), show(), and trackAvatar(). Definition at line 886 of file llfloaterworldmap.cpp. 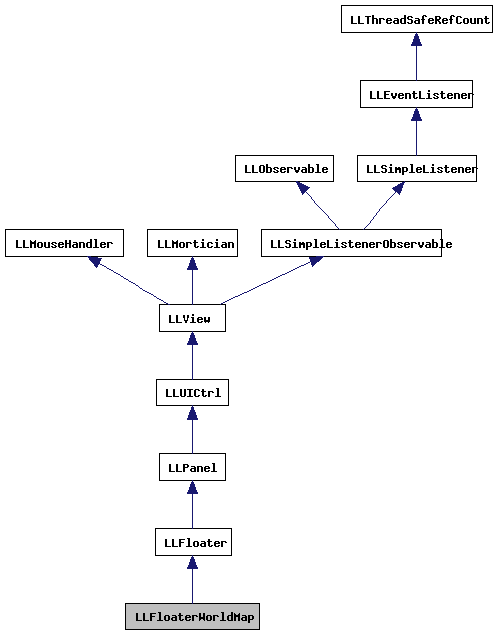 References ADD_BOTTOM, LLAssetType::AT_LANDMARK, LLPanel::childGetListInterface(), LLInventoryModel::collectDescendentsIf(), count, LLInventoryModel::EXCLUDE_TRASH, gAgent, LLAgent::getInventoryRootID(), gInventory, i, list, mLandmarkAssetIDList, mLandmarkItemIDList, LLUUID::null, LLCtrlSelectionInterface::OP_DELETE, LLDynamicArray< Type, BlockSize >::put(), LLDynamicArray< Type, BlockSize >::reset(), S32, sHomeID, and TRUE. Referenced by inventoryChanged(), onLandmarkComboPrearrange(), show(), and trackLandmark(). Definition at line 1317 of file llfloaterworldmap.cpp. References LLVector3d::clearVec(), FALSE, gAgent, LLAgent::getCameraPositionGlobal(), LLTracker::getTrackedPositionGlobal(), LLTracker::getTrackingStatus(), gWorldMap, LLVector3d::isExactlyZero(), llfloor(), LLVector3d::mdV, LLWorldMap::mIsTrackingUnknownLocation, LLWorldMap::mUnknownLocation, mWaitingForTracker, LLWorldMapView::setPan(), LLWorldMapView::sPixelsPerMeter, LLTracker::TRACKING_NOTHING, TRUE, VX, and VY. Definition at line 985 of file llfloaterworldmap.cpp. References LLPanel::childGetListInterface(), LLView::childHasKeyboardFocus(), list, mTrackedStatus, and LLTracker::TRACKING_NOTHING. Definition at line 972 of file llfloaterworldmap.cpp. References LLPanel::childGetListInterface(), LLView::childHasKeyboardFocus(), and list. Definition at line 947 of file llfloaterworldmap.cpp. References LLPanel::childGetListInterface(), LLView::childHasKeyboardFocus(), LLPanel::childSetValue(), FALSE, gWorldMap, list, mCompletingRegionName, mExactMatch, LLWorldMap::mIsTrackingCommit, LLCtrlSelectionInterface::OP_DELETE, and SIM_COORD_DEFAULT. Referenced by onLocationCommit(), and LLTracker::stopTrackingLocation(). Definition at line 197 of file llfloaterworldmap.cpp. Definition at line 448 of file llfloaterworldmap.cpp. References LLSD::asReal(), centerOnTarget(), LLPanel::childGetValue(), LLPanel::childSetColor(), LLPanel::childSetEnabled(), LLFloater::draw(), f, gAgent, gDisabledTrackColor, LLTimer::getElapsedSeconds(), LLFrameTimer::getElapsedTimeF32(), LLAgent::getRegion(), LLFrameTimer::getStarted(), LLTracker::getTrackingStatus(), LLView::getVisible(), gTrackColor, gWorldMap, LLAgent::isGodlike(), LLViewerRegion::isPrelude(), lerp(), MAP_ZOOM_TIME, mCompletingRegionName, mCurZoomVal, LLFloater::mDragHandle, LLWorldMap::mIsTrackingUnknownLocation, mSLURL, mWaitingForTracker, mZoomTimer, LLView::setMouseOpaque(), LLWorldMapView::setScale(), LLFrameTimer::start(), LLFrameTimer::stop(), LLTracker::TRACKING_AVATAR, LLTracker::TRACKING_LANDMARK, LLTracker::TRACKING_LOCATION, TRUE, and updateLocation(). Definition at line 1354 of file llfloaterworldmap.cpp. References LLFloater::close(), gAgent, LLTracker::getTrackedPositionGlobal(), LLVector3d::isExactlyZero(), make_ui_sound(), and LLAgent::startAutoPilotGlobal(). Definition at line 1516 of file llfloaterworldmap.cpp. References gAgent, LLAvatarTracker::instance(), and LLAgent::startAutoPilotGlobal(). Definition at line 1453 of file llfloaterworldmap.cpp. References gAgent, LLTracker::getTrackedLandmarkAssetID(), LLTracker::getTrackedPositionGlobal(), LLTracker::hasLandmarkPosition(), and LLAgent::startAutoPilotGlobal(). Definition at line 832 of file llfloaterworldmap.cpp. References buildAvatarIDList(), LLPanel::childGetSelectionInterface(), gAgent, LLRelationship::GRANT_MAP_LOCATION, LLAvatarTracker::instance(), LLAgent::isGodlike(), LLUUID::notNull(), NULL, LLTracker::stopTracking(), and t.
Referenced by LLMapFriendObserver::changed(), and observeFriends(). Definition at line 935 of file llfloaterworldmap.cpp. References gAgent, LLAgent::getPositionGlobal(), LLVector3d::magVec(), LLVector3d::mdV, and VZ. Referenced by LLTracker::cacheLandmarkPosition(), and LLTracker::render3D(). Definition at line 95 of file llfloaterworldmap.h. Definition at line 414 of file llfloaterworldmap.cpp. Definition at line 421 of file llfloaterworldmap.cpp. References LLSD::asReal(), LLPanel::childGetValue(), LLPanel::childSetValue(), f, FALSE, LLView::getVisible(), LLFloater::isFrontmost(), LLFloater::isMinimized(), and TRUE. Definition at line 388 of file llfloaterworldmap.cpp. References LLFloater::close(), gFloaterWorldMap, mIsClosing, and TRUE. Definition at line 812 of file llfloaterworldmap.cpp. References buildLandmarkIDLists(), LLTracker::getTrackedLandmarkItemID(), and trackLandmark(). Referenced by LLMapInventoryObserver::changed(), and observeInventory(). Definition at line 822 of file llfloaterworldmap.cpp. References LLAvatarTracker::addObserver(), friendsChanged(), LLAvatarTracker::instance(), and mFriendObserver. Definition at line 793 of file llfloaterworldmap.cpp. References LLInventoryModel::addObserver(), inventoryChanged(), mInventory, mInventoryObserver, NULL, and LLInventoryModel::removeObserver(). Definition at line 1177 of file llfloaterworldmap.cpp. References LLPanel::childGetListInterface(), LLUICtrlFactory::getComboBoxByName(), LLComboBox::getSimple(), LLTracker::getTrackingStatus(), gFloaterWorldMap, list, LLUUID::notNull(), onShowTargetBtn(), and LLTracker::TRACKING_NOTHING. Definition at line 1149 of file llfloaterworldmap.cpp. References LLAvatarTracker::getAvatarID(), gFloaterWorldMap, LLAvatarTracker::instance(), LLUUID::isNull(), list, NULL, and LLTracker::stopTracking(). Definition at line 1309 of file llfloaterworldmap.cpp. Definition at line 1258 of file llfloaterworldmap.cpp. References FALSE, gWorldMap, LLWorldMap::mIsTrackingUnknownLocation, LLTracker::stopTracking(), LLTracker::TRACKING_NOTHING, and TRUE. Definition at line 1291 of file llfloaterworldmap.cpp. Definition at line 296 of file llfloaterworldmap.cpp. Definition at line 1525 of file llfloaterworldmap.cpp. References gWorldMap, S32, and LLWorldMap::setCurrentLayer(). Definition at line 1610 of file llfloaterworldmap.cpp. References LLTracker::getTrackedPositionGlobal(), LLTracker::getTrackingStatus(), LLVector3d::mdV, LLTracker::TRACKING_LOCATION, VX, VY, and VZ. Definition at line 1628 of file llfloaterworldmap.cpp. References LLSD::asString(), from_region_handle(), gWorldMap, list, LLVector3d::mdV, LLWorldMap::mSimInfoMap, onShowTargetBtn(), LLStringBase< char >::toLower(), VX, VY, and VZ. Referenced by postBuild(), and updateSims(). Definition at line 1298 of file llfloaterworldmap.cpp. References LLWindow::copyTextToClipboard(), gViewerWindow, LLViewerWindow::mWindow, LLAlertDialog::showXml(), and utf8str_to_wstring(). Definition at line 1269 of file llfloaterworldmap.cpp. Definition at line 1069 of file llfloaterworldmap.cpp. References LLFloater::close(), gAgent, gFloaterWorldMap, and LLAgent::teleportHome(). Definition at line 1436 of file llfloaterworldmap.cpp. Definition at line 1100 of file llfloaterworldmap.cpp. References LLPanel::childGetListInterface(), LLInventoryItem::getAssetUUID(), LLInventoryModel::getItem(), LLTracker::getTrackingStatus(), gFloaterWorldMap, gInventory, LLUUID::isNull(), list, NULL, onShowTargetBtn(), LLUUID::setNull(), sHomeID, LLTracker::stopTracking(), and LLTracker::TRACKING_NOTHING. Definition at line 1077 of file llfloaterworldmap.cpp. References buildLandmarkIDLists(), gFloaterWorldMap, LLUUID::isNull(), list, NULL, and LLTracker::stopTracking(). Definition at line 1219 of file llfloaterworldmap.cpp. References clearLocationSelection(), FALSE, gFloaterWorldMap, gWorldMap, mCompletingRegionName, LLWorldMap::mIsTrackingCommit, LLWorldMap::sendNamedRegionRequest(), LLStringBase< char >::toLower(), LLStringBase< char >::trim(), and TRUE. Definition at line 1046 of file llfloaterworldmap.cpp. References LLTabContainerCommon::getCurrentPanel(), gFloaterWorldMap, llassert, mTabs, PAN_DOWN, PAN_LEFT, PAN_RIGHT, PAN_UP, S32, and LLWorldMapView::translatePan(). Definition at line 1281 of file llfloaterworldmap.cpp. References FALSE, LLWorldMapView::setPan(), and TRUE. Definition at line 1275 of file llfloaterworldmap.cpp. Referenced by onAvatarComboCommit(), onCommitSearchResult(), onLandmarkComboCommit(), and postBuild(). Definition at line 202 of file llfloaterworldmap.cpp. References LLPanel::childHide(), LLPanel::childSetAction(), LLPanel::childSetCommitCallback(), LLPanel::childSetDoubleClickCallback(), LLPanel::childSetFocusChangedCallback(), LLPanel::childSetKeystrokeCallback(), LLPanel::childSetValue(), f, FALSE, gAgent, LLUICtrlFactory::getComboBoxByName(), LLUICtrlFactory::getPanelByName(), LLUICtrlFactory::getTabContainerByName(), gMapScale, LLAgent::isTeen(), mCurZoomVal, mTabs, mZoomTimer, NULL, onAvatarComboCommit(), onAvatarComboPrearrange(), onClearBtn(), onClickTeleportBtn(), onCommitBackground(), onCommitLocation(), onCommitSearchResult(), onCopySLURL(), onGoHome(), onLandmarkComboCommit(), onLandmarkComboPrearrange(), onLocationCommit(), onShowAgentBtn(), onShowTargetBtn(), LLComboBox::selectFirstItem(), LLPanel::setDefaultBtn(), LLComboBox::setPrearrangeCallback(), LLTabContainerCommon::setTabChangeCallback(), LLTabContainerCommon::setTabUserData(), LLFrameTimer::stop(), TRUE, and updateSearchEnabled(). Definition at line 362 of file llfloaterworldmap.cpp. References LLWorldMap::eraseItems(), gWorldMap, and LLWorldMap::sendMapLayerRequest(). Definition at line 435 of file llfloaterworldmap.cpp. Definition at line 396 of file llfloaterworldmap.cpp. References gSavedSettings, gWorldMap, LLControlGroup::setBOOL(), and LLFloater::setVisible(). Referenced by LLViewerWindow::initWorldUI(), and onClose(). Definition at line 302 of file llfloaterworldmap.cpp. References adjustZoomSliderBounds(), LLAssetType::AT_LANDMARK, buildAvatarIDList(), buildLandmarkIDLists(), centerOnTarget(), LLPanel::childSetFocus(), LLWorldMapView::clearLastClick(), LLWorldMap::clearSimFlags(), LLWorldMap::eraseItems(), FALSE, LLInventoryModel::findCategoryUUIDForType(), LLTabContainerCommon::getCurrentPanel(), LLTabContainerCommon::getCurrentPanelIndex(), LLTracker::getTrackingStatus(), LLView::getVisible(), gFloaterWorldMap, gFocusMgr, gInventory, gWorldMap, mIsClosing, mSetToUserPosition, mTabs, LLFloater::open(), S32, LLWorldMap::setCurrentLayer(), LLWorldMapView::setPan(), LLInventoryModel::startBackgroundFetch(), LLTracker::TRACKING_NOTHING, LLFocusMgr::triggerFocusFlash(), TRUE, LLWorldMapView::updateVisibleBlocks(), and LLFirstUse::useMap(). 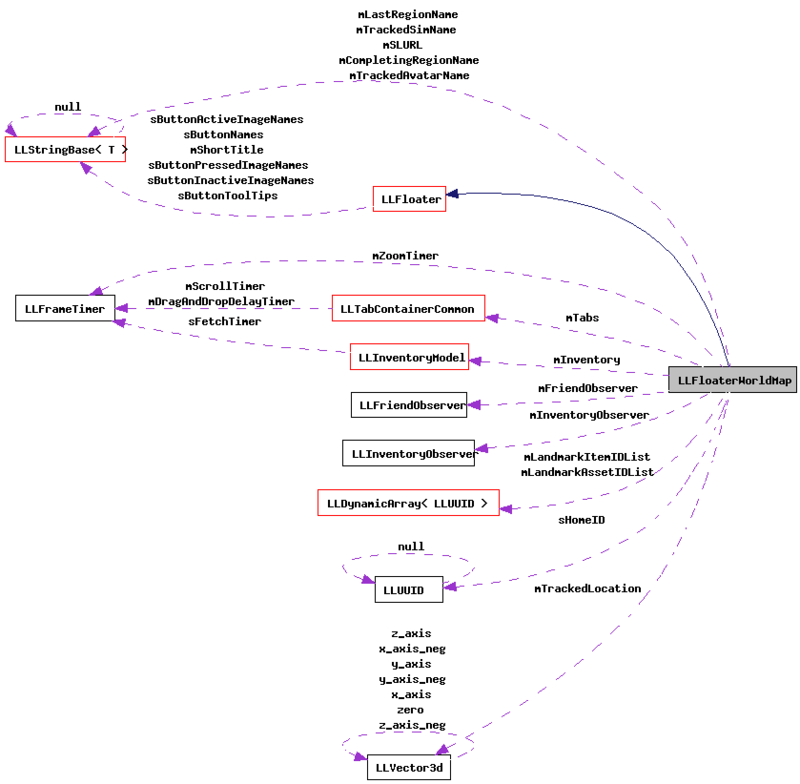 Referenced by LLFloaterLandHoldings::buttonCore(), handle_show_newest_map(), handle_track_avatar(), LLNetMap::handleDoubleClick(), LLPanelPlace::onClickMap(), LLPanelPick::onClickMap(), LLPanelEvent::onClickMap(), LLPanelClassified::onClickMap(), LLPanelAvatar::onClickTrack(), LLPanelGroupLandMoney::impl::onMapButton(), process_script_teleport_request(), and toggle(). Definition at line 1373 of file llfloaterworldmap.cpp. References LLPanel::childGetValue(), FALSE, gAgent, LLLandmarkList::getAsset(), LLLandmark::getGlobalPos(), LLAvatarTracker::getGlobalPos(), LLAgent::getRegionHost(), LLLandmark::getRegionID(), LLTracker::getTrackedLandmarkAssetID(), LLTracker::getTrackedPositionGlobal(), LLTracker::getTrackingStatus(), gLandmarkList, gMessageSystem, LLAvatarTracker::haveTrackingInfo(), LLAvatarTracker::instance(), LLVector3d::isExactlyZero(), make_ui_sound(), LLVector3d::mdV, NULL, LLLandmark::requestRegionHandle(), sHomeID, LLAgent::teleportHome(), LLAgent::teleportViaLandmark(), LLAgent::teleportViaLocation(), LLTracker::TRACKING_AVATAR, LLTracker::TRACKING_LANDMARK, LLTracker::TRACKING_LOCATION, TRUE, and VZ. Definition at line 1505 of file llfloaterworldmap.cpp. References gAgent, LLAvatarTracker::getGlobalPos(), LLAvatarTracker::haveTrackingInfo(), LLAvatarTracker::instance(), and LLAgent::teleportViaLocation(). Definition at line 1465 of file llfloaterworldmap.cpp. References FALSE, gAgent, LLLandmarkList::getAsset(), LLLandmark::getGlobalPos(), LLAgent::getRegionHost(), LLLandmark::getRegionID(), LLTracker::getTrackedLandmarkAssetID(), gLandmarkList, gMessageSystem, NULL, LLLandmark::requestRegionHandle(), sHomeID, LLAgent::teleportViaLandmark(), and TRUE. Definition at line 371 of file llfloaterworldmap.cpp. References LLFloater::close(), FALSE, LLView::getVisible(), gFloaterWorldMap, mIsClosing, NULL, show(), TRUE, and LLFloater::visible(). Referenced by handle_map(), and LLShowFloater::handleEvent(). Definition at line 542 of file llfloaterworldmap.cpp. References buildAvatarIDList(), LLPanel::childGetSelectionInterface(), LLPanel::childSetValue(), f, gAgent, LLAgent::isGodlike(), mTrackedAvatarName, mTrackedStatus, NULL, LLCtrlSelectionInterface::setCurrentByID(), LLPanel::setDefaultBtn(), LLTracker::stopTracking(), LLTracker::trackAvatar(), and LLTracker::TRACKING_AVATAR. Definition at line 617 of file llfloaterworldmap.cpp. References LLTracker::LOCATION_EVENT, LLItemInfo::mName, LLItemInfo::mPosGlobal, LLItemInfo::mToolTip, mTrackedStatus, LLPanel::setDefaultBtn(), LLTracker::TRACKING_LOCATION, and LLTracker::trackLocation(). Definition at line 624 of file llfloaterworldmap.cpp. References LLTracker::LOCATION_ITEM, LLItemInfo::mName, LLItemInfo::mPosGlobal, LLItemInfo::mToolTip, mTrackedStatus, LLPanel::setDefaultBtn(), LLTracker::TRACKING_LOCATION, and LLTracker::trackLocation(). Definition at line 572 of file llfloaterworldmap.cpp. References buildLandmarkIDLists(), LLPanel::childGetSelectionInterface(), LLDynamicArray< Type, BlockSize >::count(), FALSE, LLDynamicArray< Type, BlockSize >::get(), LLLandmarkList::getAsset(), LLUICtrlFactory::getComboBoxByName(), LLComboBox::getSimple(), gLandmarkList, mLandmarkAssetIDList, mLandmarkItemIDList, mTrackedStatus, NULL, S32, LLCtrlSelectionInterface::setCurrentByID(), LLPanel::setDefaultBtn(), sHomeID, LLTracker::stopTracking(), LLTracker::TRACKING_LANDMARK, LLTracker::trackLandmark(), and TRUE. Referenced by inventoryChanged(), LLPanelPlace::onClickTeleport(), and open_landmark_callback(). Definition at line 631 of file llfloaterworldmap.cpp. References FALSE, gWorldMap, llformat(), llround(), LLSimInfo::mAccess, LLVector3d::mdV, LLWorldMap::mInvalidLocation, LLWorldMap::mIsTrackingCommit, LLWorldMap::mIsTrackingDoubleClick, LLWorldMap::mIsTrackingUnknownLocation, mTrackedStatus, LLWorldMap::mUnknownLocation, NULL, REGION_WIDTH_METERS, S32, LLWorldMap::sendMapBlockRequest(), LLPanel::setDefaultBtn(), SIM_ACCESS_DOWN, LLWorldMap::simInfoFromPosGlobal(), LLWorldMap::simNameFromPosGlobal(), LLTracker::stopTracking(), LLTracker::TRACKING_LOCATION, LLTracker::trackLocation(), TRUE, VX, VY, and VZ. Referenced by LLFloaterLandHoldings::buttonCore(), LLWorldMapView::checkItemHit(), LLWorldMapView::handleClick(), LLEventNotifier::notifyCallback(), LLPanelPlace::onClickMap(), LLPanelPick::onClickMap(), LLPanelEvent::onClickMap(), LLPanelClassified::onClickMap(), LLPanelPlace::onClickTeleport(), LLPanelPick::onClickTeleport(), LLPanelEvent::onClickTeleport(), LLPanelClassified::onClickTeleport(), LLPanelGroupLandMoney::impl::onMapButton(), LLWorldMap::processMapBlockReply(), LLMapLayerResponder::result(), and trackURL(). Definition at line 763 of file llfloaterworldmap.cpp. References LLPanel::childSetValue(), LLSimInfo::getGlobalPos(), gFloaterWorldMap, gWorldMap, llclamp(), mCompletingRegionName, LLWorldMap::mIsTrackingCommit, LLVector3::mV, LLWorldMap::sendNamedRegionRequest(), LLPanel::setDefaultBtn(), LLWorldMap::simInfoFromName(), LLStringBase< char >::toLower(), trackLocation(), TRUE, VX, VY, and VZ. Definition at line 677 of file llfloaterworldmap.cpp. References LLPanel::childSetValue(), LLWeb::escapeURL(), FALSE, gAgent, LLAgent::getPositionGlobal(), LLTracker::getTrackedPositionGlobal(), LLTracker::getTrackingStatus(), gWorldMap, LLVector3d::isExactlyZero(), LLAgent::isGodlike(), llformat(), llround(), LLVector3d::mdV, mSetToUserPosition, mSLURL, mTrackedLocation, mTrackedSimName, mTrackedStatus, REGION_WIDTH_METERS, S32, LLWorldMap::simNameFromPosGlobal(), LLTracker::TRACKING_AVATAR, LLTracker::TRACKING_NOTHING, VX, VY, and VZ. Definition at line 1204 of file llfloaterworldmap.cpp. References gFloaterWorldMap, NULL, and LLPanel::setDefaultBtn(). Definition at line 1538 of file llfloaterworldmap.cpp. References LLPanel::childGetListInterface(), LLPanel::childSetFocus(), FALSE, gWorldMap, list, mCompletingRegionName, mExactMatch, LLWorldMap::mIsTrackingCommit, LLWorldMap::mSimInfoMap, NULL, onCommitSearchResult(), LLCtrlSelectionInterface::OP_DELETE, LLCtrlSelectionInterface::OP_DESELECT, S32, LLStringBase< char >::toLower(), and TRUE. Referenced by LLWorldMap::processMapBlockReply(), and LLMapLayerResponder::result(). Definition at line 176 of file llfloaterworldmap.h. Referenced by clearLocationSelection(), draw(), onLocationCommit(), trackURL(), and updateSims(). Definition at line 163 of file llfloaterworldmap.h. Definition at line 179 of file llfloaterworldmap.h. Referenced by clearLocationSelection(), and updateSims(). Definition at line 174 of file llfloaterworldmap.h. Referenced by observeFriends(), and ~LLFloaterWorldMap(). Definition at line 168 of file llfloaterworldmap.h. Definition at line 172 of file llfloaterworldmap.h. Referenced by observeInventory(), and ~LLFloaterWorldMap(). Definition at line 173 of file llfloaterworldmap.h. Definition at line 181 of file llfloaterworldmap.h. Referenced by hide(), show(), and toggle(). Definition at line 166 of file llfloaterworldmap.h. Referenced by buildLandmarkIDLists(), and trackLandmark(). Definition at line 167 of file llfloaterworldmap.h. Definition at line 177 of file llfloaterworldmap.h. Definition at line 182 of file llfloaterworldmap.h. Referenced by show(), and updateLocation(). Definition at line 188 of file llfloaterworldmap.h. Referenced by draw(), and updateLocation(). Definition at line 160 of file llfloaterworldmap.h. Referenced by adjustZoomSliderBounds(), onPanBtn(), postBuild(), show(), and ~LLFloaterWorldMap(). Definition at line 187 of file llfloaterworldmap.h. Definition at line 184 of file llfloaterworldmap.h. Definition at line 186 of file llfloaterworldmap.h. Definition at line 185 of file llfloaterworldmap.h. Referenced by clearAvatarSelection(), trackAvatar(), trackEvent(), trackGenericItem(), trackLandmark(), trackLocation(), and updateLocation(). Definition at line 178 of file llfloaterworldmap.h. Referenced by centerOnTarget(), and draw(). Definition at line 164 of file llfloaterworldmap.h. Definition at line 170 of file llfloaterworldmap.h. Referenced by buildLandmarkIDLists(), getHomeID(), onLandmarkComboCommit(), teleport(), teleportToLandmark(), and trackLandmark().